The Flowserve NAF-Trunnball design provides excellent control performance and tightness in both directions, even at high differential pressures. NAF-Trunnball is an excellent solution where media and extreme pressure conditions make severe demands on design, material and performance. Equipped with NAF´s unique pre-load self adjustable double stem packing. The trunnion mounted ball design provides excellent control performance and tightness in both directions, even at high differential pressures. Service-friendly due to the off-center body split and modular design. 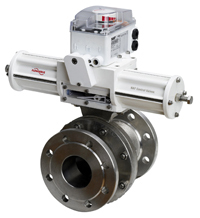 NAF-Trunnball is an integrated part in the NAF control valve package with a unique direct mounting concept.